What if next door also goes up For Sale? So, you decide to sell your house after months of planning, however, two days before your house is due to go on the market, a ‘FOR SALE’ board goes up next door! It’s every vendor’s nightmare, or is it? 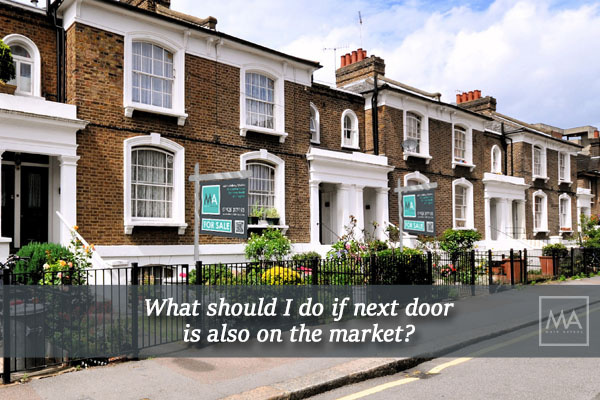 It’s inevitable that this will sometimes occur, especially in built-up residential areas where you may often find 3 or 4 properties for sale on the same street. There are also certain times of the year when this may be more likely to happen, for example, spring or early summer when the number of ‘newly for-sale’ properties is at its highest. You may be thinking that this is a disaster in the making, but it certainly doesn’t need to be, and could even be turned into a positive situation with the right knowledge. I recommend that you try and see the positive side of your position. If more than one house is for sale next door to each other, or a few doors down, it gives viewers more of an incentive to view both! It could be worth having a chat with your neighbour (you probably know them anyway) to see if you can both use the same estate agent. That way the agent will suggest to any potential viewers that they view both properties at the same time. 2) See it as healthy competition. It will give you even more incentive to present your home to its absolute best for every viewing. Don’t be defeated… de-clutter, tidy and freshen up your home so that it is presented to its absolute best. Maybe work on the garden or the front of the house, after all, viewers make a judgement within the first few seconds of their visit. Buy some attractive pots and plants to brighten up the front door area so it looks interesting and inviting. 3) Work together with your neighbour. This may sound a little odd at first, but if you both talk to each other regarding your asking price, and your expectations in terms of sale price, it could work in both of your favour. I suggest you be totally honest with each other; you could even come up with a plan to discuss the acceptance of any offers beforehand so that you don’t de-value each other’s homes in the process. 4) Don’t be ‘put out’ if your neighbour’s property sells first. It’s nothing personal. At the end of the day, your houses will be very different in décor and ‘feel’, so it’s just a matter of the viewer’s personal taste which one they will prefer. It also looks great from a marketing perspective… think about it… one house ‘SOLD’ nearby helps the area to look popular and desirable. It gives the impression to a vendor that they may need to act quickly to buy in your area. Lastly, remember every property is as unique as every person. Even if the layout is identical, different properties all have their own individual style and ‘fingerprint’. The fact that two or more properties are for sale nearby should not alter your chance of a sale. Your house is perfect for somebody out there; all you need to do is be patient and wait for your buyer. 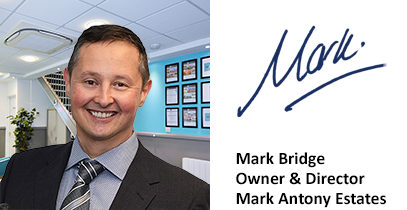 I have been in a situation in the past where I have viewed 3 similar properties on the same street and I didn’t go for the cheapest, or the one that was like a show home… I chose the one that ‘felt right’ to me. That is exactly what every buyer wants, and luckily everyone’s tastes vary. Have you ever been house-hunting and viewed more than one on the same street?